Anothr.com is a Skype-based robot that functions as a simple RSS reader. First, you need to add anothr.com to your Skype contacts. 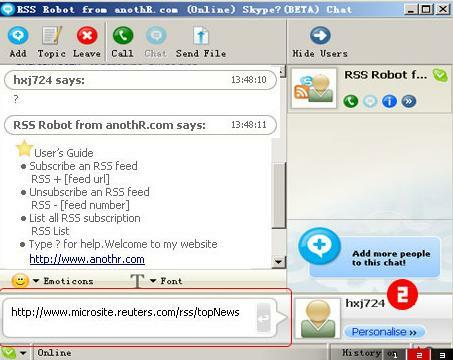 Then you use chat to talk with it and manage your feeds. To add a feed, type "RSS + http://feeds.feedburner.com/ModernDayAlchemist" if you want to add Digital Alchemy. After that, you'll get a chat message whenever there is a new post. Type in "?" is you want to see the list of commands.